Frosties or Sugar Puffs? It’s a choice that kickstarts a rollercoaster of a choose-your-own-adventure story in Bandersnatch that has captured the imagination (and rewind buttons) of millions already. But the Black Mirror interactive story might have just have one final trick hidden up its sleeve. Dubbed a ‘golden egg,’ there’s one scene that was filmed that no one can seemingly access – not even the director. 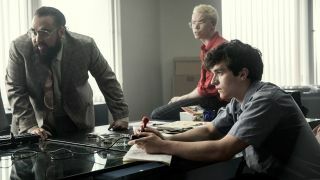 Speaking to The Hollywood Reporter, director David Slade introduces the concept of “golden eggs,” which are essentially almost impossible-to-find scenes tucked away behind codes, cryptic messages, and other breadcrumbs scattered throughout the convoluted flow-chart of narratives that make up Bandersnatch. …now isn’t that interesting? Whether it’s a case of a sneaky sleight-of-hand on the director’s part to ensure people keep rewatching Bandersnatch in the hopes of finding something completely obscure or a deleted scene kept under wraps is up for debate. It almost reads as a challenge to the internet: if you’ve got enough time, patience, and energy then there’s something else here for you - we just don’t know what it is yet. As of right now, nothing quite like that has been found. If the director can’t access it, there’s a chance it might not even be in there at all – at least for now. That’s a theory put forward by a fan on Reddit (spoilers in the link) who’s keen to punch in a few more codes in the phone you come across in one of the movie’s endings. The idea goes that Netflix will patch in a few more scenes at a later date to use in the PACS ending. Maybe trying things like Black Mirror’s Netflix premiere date of October 21, 2016 (211016/102116) will open up something new entirely? It could be nothing, but it could be everything. We’re down the rabbit hole now – and everything is fair game. Keep hunting for those golden eggs, and let us know if you’ve come across any! What should you choose next: the best movies on Netflix or the best shows on Netflix?